Mr Ezenwa Nwagwu, Chairman, Partners for Electoral Reforms, a Civil Society Organisation (CSO), has commended the high turnout of voters in the ongoing governorship election in Osun. Nwagwu, who is monitoring the election in the state, made the commendation in a telephone interview with the News Agency of Nigeria (NAN) in Abuja on Saturday. 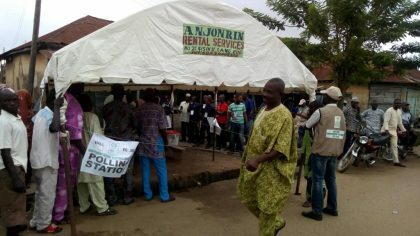 He said that between 8:00 a.m. and 9:00 a.m. accreditation and voting had already commenced as people trooped out in an orderly manner to exercise their franchise. “We are coming out from Ife now, accreditation and voting are ongoing. The punctuality is pretty nice in the areas that we have observed between the hours of 8:00 a.m. and 9:00 a.m.
“But generally, people are coming out to vote and the climate is calm and relatively peaceful,’’ he said. The chairman also commended the relatively peaceful atmosphere under which the process is going on. He, therefore, expressed the need to encourage the people of the state to continue to maintain the maturity they put in during the campaigns and the poll and remain peaceful. He expressed optimism that the outcome of the election would reflect the will and aspirations of a greater percentage of the people. “It is good to continue to encourage the people of Osun to maintain the maturity that they put in during the campaigns and ensure that they remain peaceful. “We hope that the outcome of the election reflects the will and aspirations of a greater percentage of Osun people,’’he said. NAN reports that a heavy security cordon was thrown on the state with a massive deployment of policemen and other security personnel including soldiers who were sighted on the outskirts of the state capital. Although INEC registered a total of 1,682,495 voters, some 400,000 Permanent Voters Cards remained uncollected as on Friday. NAN also reports that although 48 parties are participating in the election, the frontline candidates are Gboyega Oyetola of the All Progressives Congress (APC), Ademola Adeleke of the Peoples, Democratic Party and Iyiola Omisore of the Social Democratic (SDP).